Recently, The Today Show did a segment on common misconceptions about buying a home. In order to set the record straight, we give you the common statements you hear in real estate and why they don’t hold true. 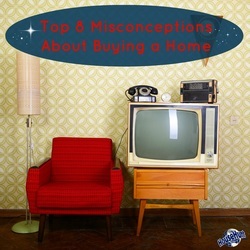 Check out these insider tips from personal finance expert Lauren Lyons Cole and Realtor Jay Morrison, as well as other myths we’ve found around the web. STATEMENT: The best time to shop for a house is during the winter months. FALSE: Any time is a great time to buy a house if it’s your dream home. You don’t want to try to play the market and then lose your dream house to another buyer, regardless of the season. STATEMENT: Your credit score is the single most important factor when applying for a mortgage. FALSE: Your credit score is important, but so is your income, how much cash you have in the bank, and the type of property you’re buying. Your credit score IS the biggest factor when it comes to determining your interest rate however (the better the credit score, the better the interest rate). STATEMENT: Being prequalified and preapproved are the same thing. FALSE: Prequalification is a lender saying s/he may extend a loan to you if the information you’ve provided is correct. Preapproval requires you to fill out a loan application and give your lender specific information about yourself and your finances and it has been verified to some extent. It will be later verified fully by an Underwriter. STATEMENT: You need 20 percent down to buy a home. FALSE: Buyers can qualify for home loans with lower down payments through the VA, FHA, and state housing programs. In fact, the VA & USDA offer loans with zero down payments. STATEMENT: You should never make an offer that’s below more than 10 percent of the asking price. FALSE: When you’re making an offer take these two things into consideration: the fair market value of the home and what you can afford. Realize that the seller may have priced the home high emotionally, so be prepared to justify your price so that you don’t offend him/her. STATEMENT: You can get preapproved after you’ve found your dream home. FALSE: You need to know how much you can afford to spend before you start looking at properties. Plus, the majority of agents won’t even take on buyer clients who haven’t yet been preapproved. STATEMENT: Your income determines your loan amount. FALSE: Your monthly and annual income is important, but so is how much debt you have. According to new mortgage rules, your monthly debt to income ratio (DTI) should be less than or equal to 43 percent. STATEMENT: You can’t get a loan with bad credit. FALSE: Guess what? Lenders are in the business of making loans, so even if you have bad credit, it’s still possible to get a loan. It will take some work and time: you’ll need to start repairing your credit, build up some savings, reduce your debts, and find the best possible loan you can. It’s not going to be the easiest process, but it’s not impossible.